Unless you’re 100 years old, when you are ready to have your food wrapped up, please don’t use those words anymore. ‘I would like a to go box’ or, ‘May I please have this wrapped up to go’, are the new replacements. Thank you. 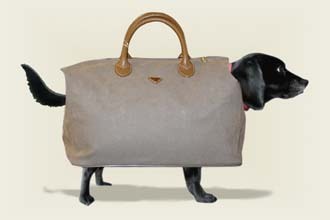 Haha, I’ve never used the term Doggy Bag so I’m well within this century. Yes! Wat was the youngest person you’d say was that day asked for a doggy bag? Are they normally asked for by Women? wow; not sure what term I use. I looked through most of your posts, and found them extremely helpful. I’ll keep an eye on how I behave in restaurants. Have you seen the boxes that some restaurants have that are actually dog-shaped? The whole food wrapping thing is ridiculous, anyway. Do you really expect me to believe that you are going to eat those two tablespoons of fish chowder tonight, after it has spent its afternoon in your hot car? I hope you enjoy your trip to the emergency room! Snickering over the “doggy bag” What about foil swans? Can I say “I’d like a foil’? I LOVE those foil swans! I get your blog… I enjoy reading what you really think… of course,you are not allowed to in a restaurant … how could you keep a job, and be tipped as well? What I’m trying to say here… is that it’s fun to have a place to go to write about ‘real things’… ‘real thoughts’ … because you are a ‘real person’. It doesn’t mean you are a bad person… you are just being like ‘us’… real. We all think such things… I love it when people speak out… I don’t think you are trying to be mean. You’re telling a story about how it is in ‘your life’. No one else can tell or write it…. so, maybe no one should take anything you say personally…. maybe just keep in mind how we treat other people, enjoy reading what happens on someone’s job, understand. Pick up tips on how to behave when in a restaurant…. there are good servers, bad servers. Simply tip the good servers, don’t tip the bad servers… go on with life. I hope I haven’t offended anyone… I did take some of the comments made here just a little personal…. because I also, write a blog… I have to once in a while remind some of my ‘family’ …that ‘this is my life’ I write about…. about all that affects ‘me’… if they played a part in affecting it, I’ll write about it (but, not to do name-calling). I do it in a very kind way. In Mumbai we say ‘parcel’ if we want something wrapped up. It’s taken me five years to stop saying that at restaurants—of which I spent four learning to not order more than I can eat. Rule of Thumb: if you’re taking it home to feed your dog, at least tip your server 30%+ for wasting our time packing that for your DOG.. I think its silly for someone to ask to bring it home for their dog. If a person is going out to eat they shouldn’t snack or eat a lot during the day so that they will be hungry enough to eat all / most of their food.